The 450-room Hotel Jen Beijing opens its doors to guests today as the city’s new destination for work, play, and travel. Conveniently located in the centre of Beijing’s central business district (CBD), the hotel features a vibrant co-working hub, the only gastropub with its own brewery in the Guomao area, and an expansive, industrial-chic world-class gym catering to fitness enthusiasts and road warriors. This debut is an important milestone for Shangri-La International Hotel Management Ltd., as it marks its 98th hotel globally and second Hotel Jen branded property in mainland China. Designed by Stickman Tribe Dubai, Hotel Jen Beijing features a distinct urban environment with a playful twist and is poised to become a vibrant space for style-savvy locals and adventurous travellers to mingle and be inspired. From the centrepiece tree sculpture and suspended porcelain leaves in the lobby to the copper beer vats laser-cut with Chinese zodiac signs in the gastropub, eye-catching works of art can be found in every corner of the hotel. Guests can continue to explore this exciting visual landscape with each guestroom floor showcasing a unique theme such as the visual arts, nature, architecture styles or personas from around the world. The 450 contemporary rooms and suites feature a soothing neutral palette with pops of colour and modern work spaces featuring multiple USB charging bays and complimentary WIFI connectivity. The spacious rooms start at 40sqm and feature floor-to-ceiling windows which bathe them in natural light. All have views of the city, with around 100 rooms and 40 suites overlooking the iconic Rem Koolhaas-designed CCTV Headquarters. The Jen 75 corner rooms offer some of the best views of the city and CCTV building. Both Jen 75 and the Jen 75 Skyline rooms start at 75 square metres and offer more space for guests and entertaining. With a kitchenette and breakfast bar, the open concept allows for seamless movement from living room to bedroom and caters to short or extended stays. Open 24/7, Prototype goes against the grain of the traditional staid business centre, presenting a vibrant co-working space complete with a cafe, individual pods and private rooms. The hotel has 13 meeting rooms and a multi-function space for up to 250 people designed to stimulate lively discussions, new collaborations and increased productivity. The 3,500-square-metre Trainyard Gym health club is open round the clock for guests who wish to get their adrenalin pumping and reach new fitness heights. Facilities include a 25-metre heated indoor pool with city views, a boxing ring, a Mixed Martial Arts area, and fitness studios where adrenalin-pumping classes will be led by certified instructors. The gym’s floor-to-ceiling windows provide unrivalled views of the city and a stylish industrial interior with vibrant graffiti artwork across two floors. Professional massages, Jacuzzis and saunas are available for those looking to ease some tight muscles after a workout. A juice bar, fully loaded with energy drinks and brain-fuel snacks, will be there for those looking to replenish their energy. San Wu Tang, an all-day-dining restaurant overlooking Beijing’s skyline, provides guests with a unique South-East Asian dining experience while staying true to the local flavours. San Wu Tang provides a farm-to-table experience, where fresh vegetables harvested from the hotel’s hydroponic area are served. Guests can enjoy the culinary action as the house chef prepares their orders at the show kitchen. Beersmith is the only gastropub in the Guomao area, brewing a refreshing selection of seasonable beers in cool copper vats. Beersmith is ideal for friends and colleagues to gather, unwind and relax. 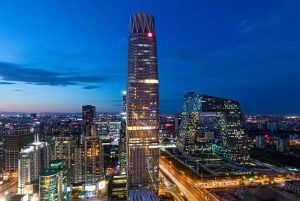 Hotel Jen Beijing is located on the first 22 floors of China World, Tower B, next to a new mall featuring a range of exciting restaurants as well as young, upcoming designers. The hotel is Shangri-La’s third hotel located in the landmark 17-hectare China World Trade Centre and is the group’s fifth hotel in Beijing.